Even though their last checks bounced, former employees consider themselves lucky because they were at least home in Houston when everything collapsed. Hundreds of other drivers are stranded at truck stops across the country. See the full story here, along with the accompanying video. I want to say that this is a just a fluke, but trucking and freight stats are indicators of economic health, too, along with housing. This is bad news, and not just for the people directly affected. Placing four chronically homeless people into permanent supportive housing in Los Angeles resulted in more than $80,000 per year in savings to taxpayers and improved quality of life for the individuals, according to a recent study led by Michael R. Cousineau, associate professor of preventive medicine at the Keck School of Medicine of USC and Heather Lander, project specialist at the USC Center for Community Health Studies. 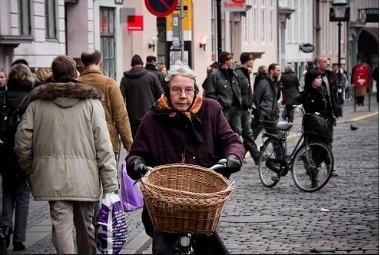 There is a terrific blog on Cycle Chic–a street fashion blog of cyclists in Copenhagen. The photographer is gifted and has an inclusive eye for who looks good–not just thin young women in thousand-dollar shoes. These images come from that blog. 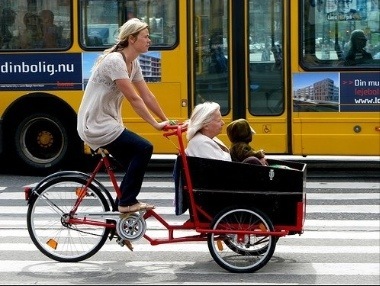 I really wish people would wear helmets. I know, I know…but the statistics. I wish designers would get busy designing sleek, affordable, fabulous helmets.